April 1 marked the beginning of the grizzly hunting season in B.C. and with provincial elections set to be held on May 9 a growing number of organizations and interest groups have weighed in as the two major parties are taking starkly different positions on this controversial subject. Last November, the BC NDP promised to ban trophy hunting of grizzly bears if elected while the ruling BC Liberals doubled down on the issue by extending the hunting season until June 15. John Horgan, the leader of the BC NDP, argued that the bears are worth far more to the province alive than dead and that statement has been confirmed by several studies which found that bear viewing generated 12 times more visitor spending and 11 times more government revenue than grizzly hunting. The Grizzly Bear Foundation Report (Page 82) and The Grizzly Truth documentary even suggest that the grizzly hunt is operated at a loss to the province and therefore subsidized by BC tax-payers who are overwhelmingly opposed to the hunt. As the election approaches an ever increasing number of organizations have made their voices heard. It began with the Grizzly Bear Foundation run by Chairman Michael Audain releasing its report on March 7, which recommended ending the grizzly hunt and painted a dark picture for the long-term survival of grizzly bears as they face multiple threats such global warming, habitat loss and food source depletion as well as the hunt. The report also argued that bear viewing and grizzly hunting cannot coexist, and that the province will have to chose which industry it wants to support. 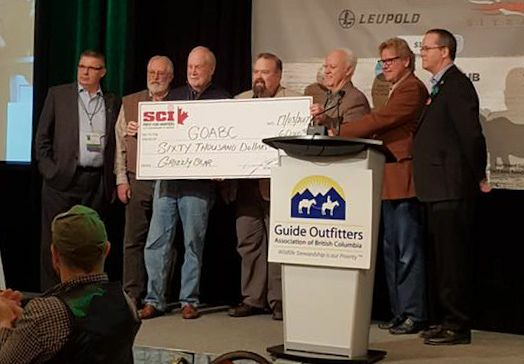 Next came the news that the American trophy hunting organization Safari Club International had donated $60,000 to the Guide Outfitters Association in order to defeat the BC NDP as images of the check being presented made the rounds on social media. The BC NDP immediately took aim at the contribution from a foreign lobby group: “Clearly [B.C. Liberal Premier] Christy Clark is happy to have outside organizations spend tens of thousands of dollars to help her get reelected, and ignore the desires of the majority of British Columbians to end the trophy hunt of grizzly bears,” George Heyman, a New Democrat MLA for Vancouver-Fairview, told the Georgia Straight, in a phone interview on March 22. On March 29 Chris Darimont from the University of Victoria published his findings about the motivations for trophy hunters and how biology plays an important part in their desire for shooting large animals like Cecil the Lion and BC’s grizzly bears. He also suggested that shaming may discourage that kind of behaviour. The same day also saw the release of a documentary that takes an in-depth look at the arguments for and against grizzly bear hunting while dispelling several myths that are still popular among grizzly hunters. The most compelling of which is the notion that hunting male grizzlies lowers cub mortality since it takes out male bears that at times predate on cubs. However both the documentary and the Grizzly Bear Foundation (Page 40) contest that assertion by quoting research showing that the opposite may be true as it could actually increase cub mortality. On March 31, the David Suzuki Foundation also presented its findings, concluding that since 1975 a total of 13,804 grizzly bears have been killed by humans, with an overwhelming majority (87 per cent) being shot by licensed hunters. The Foundation also pointed out that an average of 34 per cent females are killed each year, making grizzly bears vulnerable to decline. And just a few days ago, on April 1 — the beginning of the spring grizzly hunting season — protesters demonstrated at the stairs of the legislature in BC Victoria organized by Justice for BC Grizzlies Alliance. The rally featured speakers including Val Murray and NDP candidate, Bryce Casavant. The question is whether this issue as well as recent donation scandals will compel enough people to oust the BC Liberals and elect the NDP. But given the latest polling data which has the NDP 4 points ahead, it is a real possibility. Tom Reissmann is a documentary filmmaker. His film, The Grizzly Truth, was released in February and scrutinizes gives a thorough account of both pro and anti-grizzly hunting positions. This article was republished with author permission from The Huffington Post.